We learn lots of new things at school and have lots of fun learning through play inside and outside of our classroom. 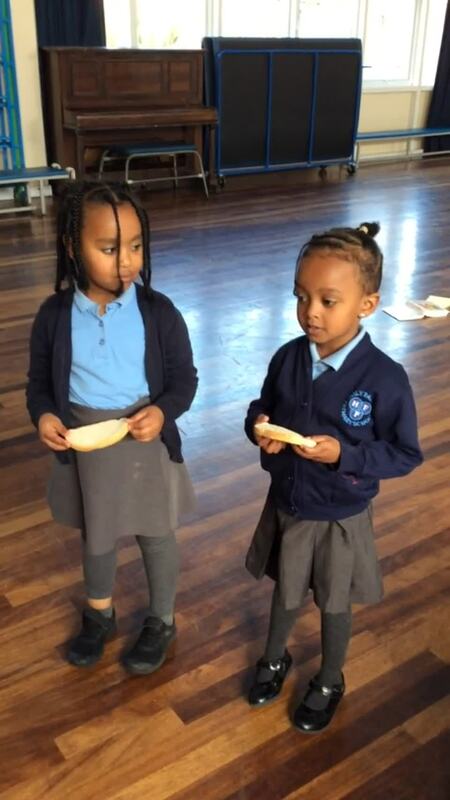 In Reception we come to school each day to work, to pray and to play in the light of the Lord. As we are in Holy week this week, we went outside and did some of the Stations of the Cross together as a class. We talked about how Jesus would have been feeling. We listened to peaceful music in between each station and we were very respectful. We have been listening to and sharing the very special story of The Last Supper in the hall. 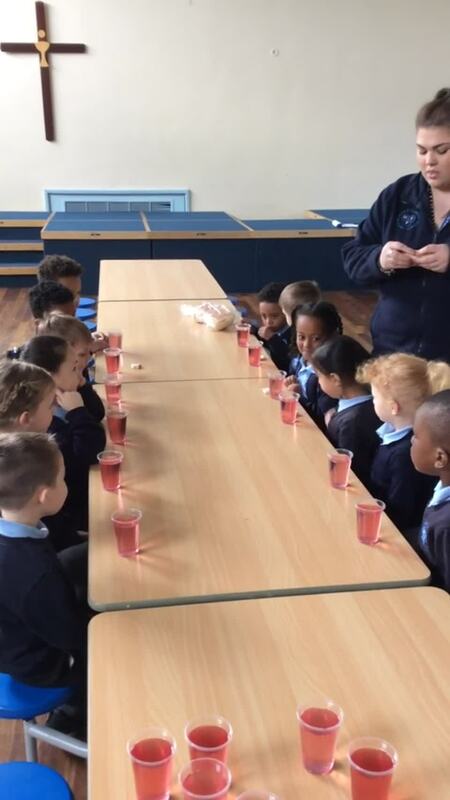 We had some bread and wine and shared our own meal to represent Jesus' body and blood. We had such fun n our school trip to Rainbow Factory yesterday. 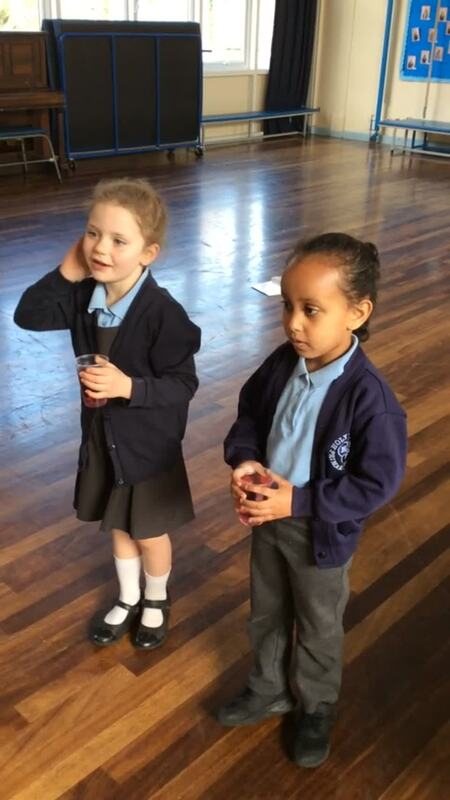 We watched a live performance of Jack and the Beanstalk and took part in some storytelling workshops. We had our lunch and then came back to school. On World Book Day, we all enjoyed dressing up as animals. We had a great time reading with our Year 6 buddies. They helped us to read tricky books and we spent time together. We have taken on a mastery approach to our Maths learning this term in Reception class. This means we are getting to grips and learning lots of higher level skills so that we can become the best number whizzes that we can be! We are having lots of fun learning Maths in lots of different ways. We have learnt lots about number 4 this week. We read a special story called 'Bears on Chairs' which was all about 4 bears and 4 chairs. We had to solve some problems because we didn't have enough chairs for all the bears. We decided that we could all share and that the bears would all be happy. We ordered the bears in size too. They are all safe and happy again. We had lots of fun learning all about Under the Sea and pirates. Here are some photos from our school trip to The Deep. We love it when our Year 6 buddies come to help us and play with us. We have been learning lots outside of our classroom for our All About Me topic this half term. Here are some photos to show you how much fun we always have! We listen to the word of Jesus each day in school. We know this is a special time for us to be able to talk to Jesus. We all really enjoyed our visit to Nell Bank. Take a look at some of the activities we took part in.